First settlements of the area occurred in VI and VII century, when Lombard families settled here to escape the barbarians invasions in Northern Italy ora maybe from plagues. The history of Castel del Rio, however, is marked by Alidosi family for over four hundred years (from XIII to the XVII century.) The feud, then called Mass of St. Ambrose, was given to Alidosi during the XIII century thanks to an imperial privilege. The family had many famous men such as Richard, mayor in Florence and then senator in Rome; Francesco, Cardinal in 1505 and confidant of Pope Julius II, who appointed him Treasurer of the Church, then ambassador of Vatican in Bologna. He was killed in Ravenna, 1511, by the Duke of Urbino. Finally Obizzo, man of law, was governor of Ravenna, Cervia, Cesena and Bertinoro, and commissioned the famous Alidosi Bridge in 1499. Intense relations with the Republic of Florence for protection, Medici Family imposed to Alidosi a coat of arms with a lily, similar to Florence one. The Alidosi Family has left to posterity a proud cultural identity witnessed by the Castle and the Bridge, very important monuments, well known all over Italy. 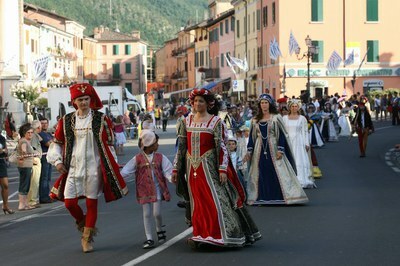 Every year in July you can appreciate an appointment to commemorate the glory of Alidosi: the Renaissance Fair.